Lake It or Leave It! How do you wage a naval battle 3,000 miles inland? The British answer in World War I was "carry the ships there." 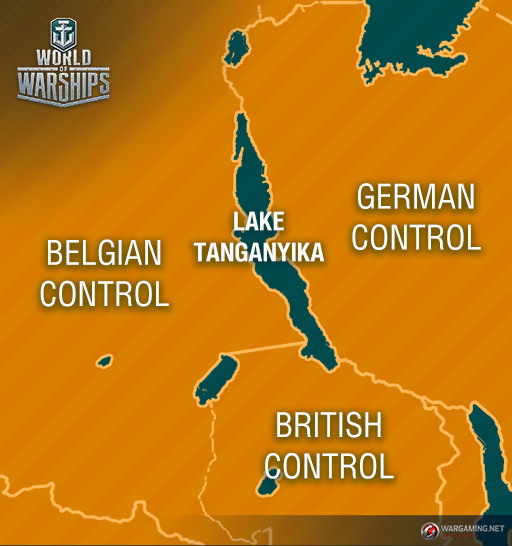 Although the Battle of Lake Tanganyika was a relatively minor clash between German and British/Belgian forces, the strange trip taken by the British to get there makes the conflict a "unique" battle in naval history. When the powder keg of European tensions and alliances exploded into World War I, the explosion also engulfed the African territorities those nations were busy colonizing. 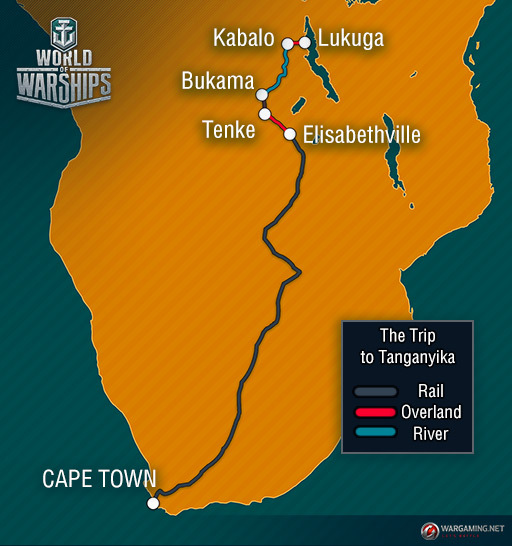 Lake Tanganyika, spanning almost 500 miles and feeding into the Congo River system, was strategically vital for water-based transport. From the war's onset, however, the Lake was dominated by Germany with their warships Hedwig von Wissmann, Kingani, and the soon-to-be-launched Graf von Götzen. 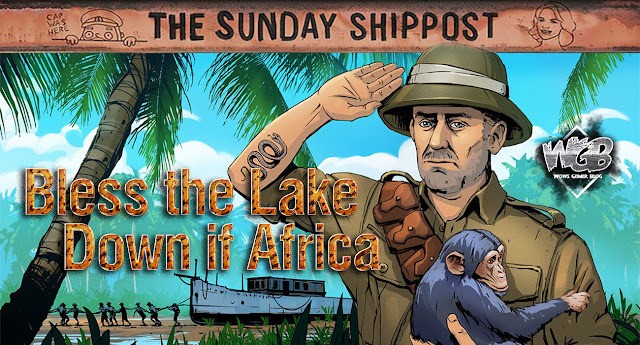 A big game hunter named John R. Lee, who had provided the intel on Graf von Götzen, pitched a wild plan to the Admiralty -- transport fully built motor gunboats overland to fight the Germans on the lake. "You have something against comfortable air flow down there, chap?" The Admirality wasn't sure who to send on such an odd mission -- so they pulled an eccentric, tattooed, double-court-martialed Lieutenant-Commander from desk duty named Geoffery Spicer-Simson. The Lieutenant-Commander already had a "colorful" reputation before the assignment. He'd run his own ship aground, almost sank an allied submarine, and had watched idly from a hotel room as a ship under his command was torpedoed and sunk. He lived up to his reputation from the get-go: insisting that the two ships be named Dog and Cat, rocking khaki skirts, and recruiting a slew of eccentric buddies for his expedition -- including a former Grand Prix driver and two burly recruits "directly from the tavern." The ships Mimi and Toutou (Spicer-Simson's second choices after the first were shot down) arrived by freight-liner in Cape Town in July 1915. From there, the motley crew later deemed "Simson's Circus" loaded the two vessels on the train and departed. Adding to the "Circus" label was Spicer-Simson's beloved pet chimp, Josephine, who came along for the ride. Once they reached the end of the main rail line in Elisabethville, they traveled overland, dragging both vessels along with the aid of steam tractors and winching systems. It took over a month and a half to traverse this 100ish-mile stretch to the next length of rail. After reaching Bukama, the ships were transported down the Lualaba River. The river turned out to be more shallow than expected, forcing the Circus to use barrel rafts to keep the transported ships afloat. Then on October 26, 1915, the Circus finally arrived at the Belgian port of Lukuga and prepared for battle. Geoffery Spicer-Simson is the guy waving enthusiastically. Simson's Circus after the capture of Kingani. Spicer-Simson, far left, is rocking his signature look. Mimi and Toutou were finally launched in December 1915. 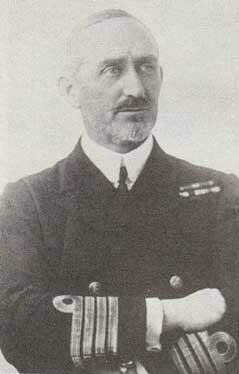 When the German ship Kingani was spotted, the speedy new British vessels set out to engage. Caugh off-guard from the rear and stuck with only a forward-facing gun, Kingani quickly surrendered and became HMS Fifi (another Spicer-Simon name) under British command. The next German encounter came in mid-January, when Hedwig von Wissman arrived to investigate the missing Kingani. Spicer-Simson's fleet, now bigger thanks to Fifi and a repaired Belgian ship, closed in. Low on shells, Fifi managed to take out Hedwig's engine with her final shot. The final and most intimidating ship, Graf von Götzen, never fought Simson's Circus. The ship was ultimately scuttled when things got too dicey for the Germans on land, pushing them to abandon the lake. After the lake was won, most of Simson's Circus were brought back to Britain. There, Spicer-Simson was simultaneously reprimanded for some of his conduct and awarded the Distinguished Service Order. Despite also being appointed a Commander of the Order of the Crown by the Belgians, neither nation ever assigned him to a command ever again. Eccentricities and mistakes aside, the expedtion of Simon's Circus was a daring, innovative, and ridiculous solution to an unlikely tactical problem -- even if it wasn't enough to lift Geoffery Spicer-Simson's "orange status."